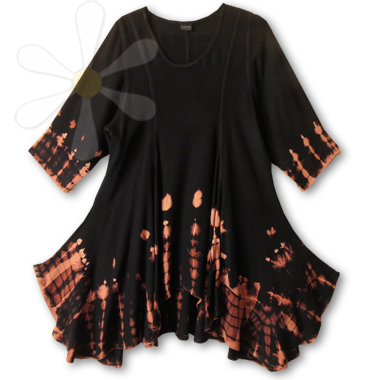 This flowy one-of-a-kind piece is one of the most stunning ever to come through our doors. This new style -- Yasmina -- is fantastic enough, but in this dip dye it is breathtaking! Worn as a tunic or dress (on shorter figures), the long princess seems are flattering on just about everyone. But the hem is the star! Shorter in the front than the back; shorter in the center than the sides. Fun, flowy and FABULOUS! Be your creative self every day... why not?